An international team of researchers led by geoscientists with the Virginia Tech College of Science recently discovered that deep portions of Earth's mantle might be as hot as it was more than 2.5 billion years ago. The study, led by Esteban Gazel, an assistant professor with Virginia Tech's Department of Geosciences, and his doctoral student Jarek Trela of Deer Park, Illinois, is published in the latest issue of Nature Geoscience. The study brings new, unprecedented evidence on the thermal evolution of the deep Earth during the past 2.5 billion years, Gazel said. The Archean Eon—covering from 2.5 to 4 billion years ago—is one of the most enigmatic times in the evolution of our planet, Gazel said. During this time period, the temperature of Earth's mantle—the silicate region between the crust and the outer core—was hotter than it is today, owing to a higher amount of radioactive heat produced from the decay of elements such as potassium, thorium, and uranium. Because Earth was hotter during this period, this interval of geologic time is marked by the widespread of occurrence of a unique rock known as komatiite. "Komatiites are basically superhot versions of Hawaiian style lava flows," Gazel said. 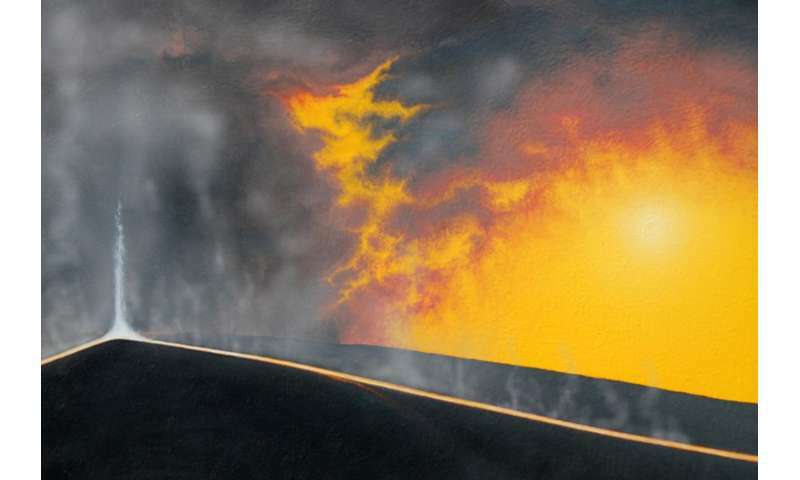 "You can imagine a Hawaiian lava flow, only komatiites were so hot that they glowed white instead of red, and they flowed on a planetary surface with very different atmospheric conditions, more similar to Venus than the planet we live on today." "Experimental studies tell us that that the magnesium concentration of basalts and komatiites is related to the initial temperature of the melt," Gazel said. "They higher the temperature, the higher the magnesium content of a basalt." The team also studied the composition olivine, the first mineral that crystallized from these lavas. Olivine—a light green mineral that Gazel has obsessively explored many volcanoes and magmatic regions to search for—is an extremely useful tool to study a number of conditions related to origin of a lava flow because it is the first mineral phase that crystallizes when a mantle melt cools. Olivines also carry inclusions of glass—that once was melt—and other smaller minerals that are helpful to decipher the secrets of the deep Earth. "We used the composition of olivine as another thermometer to corroborate how hot these lavas were when they began to cool," Gazel said. "You can determine the temperature that basaltic lava began crystallizing by analyzing the composition of olivine and inclusions of another mineral called spinel. At higher temperatures, olivine will incorporate more aluminum into its structure and spinel will incorporate more chromium. If you know how much of these elements are present in each mineral, then you know the temperature at which they crystallized." The team found that Tortugal olivines crystallized at temperature nearing 2,900 degrees Fahrenheit (1,600 degrees Celsius)—as high as temperatures recorded by olivines from komatiites—making this a new record on lava temperatures in the past 2.5 billion years. "What is really fascinating about this study is that we show that the planet is still capable of producing lavas as hot as during Archean time period," Gazel said. "Based on our results from Tortugal lavas, we think that mantle plumes are 'tapping' a deep, hot region of the mantle that hasn't cooled very much since the Archean. We think that this region is probably being sustained by heat from the crystallizing core of the planet." "This is a really interesting discovery and we are going to keep investigating Tortugal," said Trela, a doctoral student and the first author of the paper. "Although the Tortugal Suite was first discovered and documented more than 20 years ago, it wasn't until now that we have the technology and experimental support to better understand the global implications of this location." 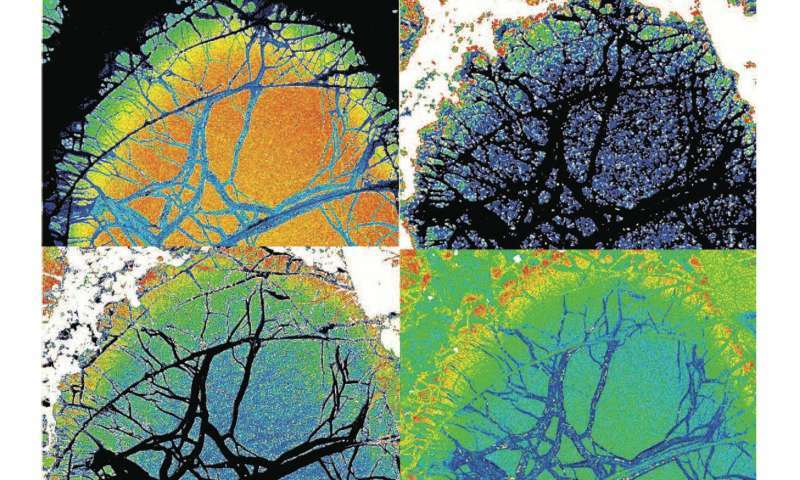 Trela added, "Our new data suggest that this suite of rocks offers tremendous opportunity to answer key questions regarding the accretion of the Earth, its thermal evolution, and the geochemical messages that mantle plumes bring to the surface of the planet."